The twenty-first JASMEE Academic Meeting will be held on July 28 & 29, 2018 at The Nippon Dental University School of Life Dentistry at Tokyo. The time schedule can be seen here. 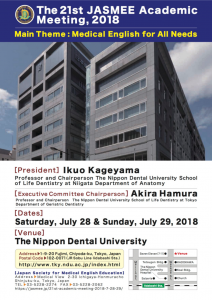 All participants should register on arrival at the registration desk on the 3rd floor of The Nippon Dental University. Applications to attend the Saturday evening reception will also be accepted. The registration desk will open at 9:00 a.m. on both days. Attendance fees: members 8,000 yen, student members 3,000 yen, non-members 9,000 yen. Attendance ID badges must be worn at all times during the Meeting. Those wishing to apply for JASMEE membership or pay outstanding annual membership fees may do so at the registration desk. The membership fee for 2018 is 9,000 yen (includes 3 issues of the Journal of Medical English Education). The membership fee for student members is 1,000 yen (Journal subscription not included). A reception will be held at Enka-en (Chinese restaurant in Kagurazaka, 10 minutes’ walk from the venue) starting at 18:10, Saturday, July 28. The attendance fee is 6,000 yen (payable in advance at the reception desk). Hotels neighboring the venue are listed here.